And the Winner Is . . . Photography! The Nobel Prize jury recently announced three winners in physics, who’ve been dubbed "the masters of light" for their innovations in the ways photographic images are captured and distributed. Charles Kuen Kao was awarded half of the $1.4 million prize money for his groundbreaking achievement in fiber optics. Of more specific interest to THE BIGGER PICTURE, the other half of the award is being split by two researchers, William Boyle and George Smith, who worked together at Bell Laboratories in New Jersey years ago, and whose 1969 invention of the CCD sensor, made digital imaging possible and transformed photography in the process. “Together,” said Frederick Dylla, director of the American Insitute of Physics, quoted in a recent Chicago Tribune article, “these inventions may have had a greater impact on humanity than any others in the last half-century." If you’re like us, and like to explore the ways photography transforms our lives and world, which we do in our online project click! photography changes everything, you understand that Dylla’s not exaggerating. CCDs are based on the photoelectric effect, which Albert Einstein, who seldom shied away from cameras, won a 1921 Nobel Prize for discovering. 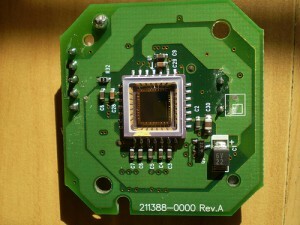 CCDs are, simply put, arrays of photo cells that translate light into electrical signals. They turn optical images into digital ones. They made cell phone cameras (which Philippe Kahn, one of our click! contributors pioneered) possible and practical. They are essential to medical photography and for making the kinds of diagnostic images that ophthalmic photographer Michael Kelly described in his story for click!. If you’re in the dark about how CCDs were discovered and record light, take a look Charlie Sorrel’s helpful post on WIRED News to understand why this Nobel Prize choice is such big photo story.